Violence, terrorism, natural disasters, and scandals are all too common in today’s world. The church can and should respond to these occurrences with compassion and hope. The arts and creativity can provide excellent vehicles to help us convey God’s heart in these situations. In the previous post we offered ideas for how the arts operating within the church can help congregations process and respond to crises and disasters. This post focuses on outreach; how can creative churches reach out with the arts to offer ministry and hope to our neighborhoods, cities, and more when a crisis hits? 1. Create art or crafts to be presented to those who are experiencing the effects of disaster or crisis. When Colorado Springs was hit with a fire that destroyed hundreds of homes, Cindy West Limbrick, creative director at Woodman Valley Chapel, noticed a burned-out home with an untouched flowerpot on the front steps, still full of flowers. A little splash of life in the ashes. 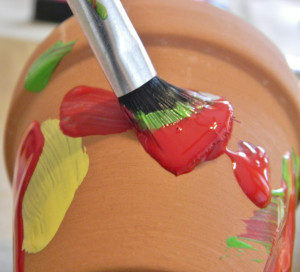 That gave her an idea to have artists at her church create custom decorated flowerpots, plant seeds in them and deliver them to the devastated homes. 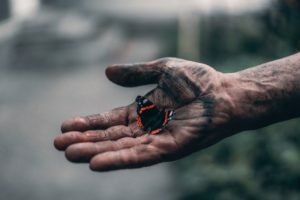 They called the outreach “Beauty for Ashes.” Offering a bit of beauty in devastation can bring a glimmer of much needed hope to a horrible situation. A caring message and contact info can be included so victims can connect, if they like. Artists, crafters, children—really anyone–can contribute to a simple project like this. A similar idea would be to upcycle broken items from a disaster area to create something new (such as jewelry) then sell them to provide a revenue stream for the victims, like the Nozomi Project did for women affected by the 2011 Japanese Tsunami. 4. Have artists in your congregation paint, draw, or photograph portraits of victims, which the artists will give to them or their loved ones. The artists might go to the location or create remotely, whichever is more appropriate. Two artists have done something similar for homeless people in Los Angeles and their models could easily be applied to victims of tragedy. Jason Leith with his Sacred Streets project and Brian Peterson with his Faces of Santa Ana project both develop relationships with the people they paint and directly benefit those people with the display and sale of the artwork. 5. Support or commission experienced artists to create art that responds to the crisis or tragedy. Connect with local artists (who may not be part of your congregation) to create something with their art form that is designed to bring hope and healing, and can be presented to those who are suffering. 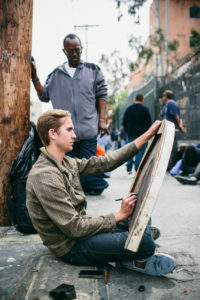 By commissioning a local artist you’ll be accomplishing at least three things: supporting a person in your community in what they are called to do, enabling a unique artistic expression that emanates from your local community, and providing a potentially powerful artistic vehicle for conveying hope and beauty to those who are suffering. 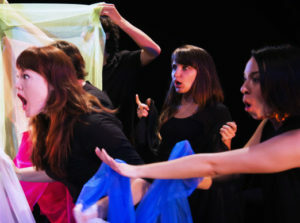 In addition to supporting local artists, you might consider connecting with national traveling artists like the Salvation Army’s Army on Its Toes to present a piece at the site of the crisis. If your church sends teams to disaster scenes with a organization like Convoy of Hope, consider equipping some artists to go along, using ideas similar to these. (Check with the organization first.) God loves to collaborate creatively with us to bring hope to broken situations. There are two important points to make in initiating outreach through the arts. First, consider the particular callings and skills of the artists in your church, and how you can partner with them in outreach ministry. God will often give your congregation unique ideas and expressions through the creative people you have. Second, and most importantly, any form of ministry in a crisis situation must be done in with sensitivity, respect, and humility, looking for ways to meet real, immediate needs instead of barreling ahead with what we think people might need. In these types of situations God’s love is often shared most effectively with caring actions, and not just words. And that is why the arts can be wonderful allies in such times. They can convey his love, peace, and grace in ways that can be felt and experienced, slipping past the intellect and penetrating the heart. The New Renaissance is working on a new resource for arts ministry in troubled times: the CreativeChurch Disaster and Crisis Ministry Handbook: Responding to Tragedies and Current Events through Arts Ministry. Subscribe here to receive updates and info. CreativeChurch Arts Ideas is the official blog of the New Renaissance Arts Movement.